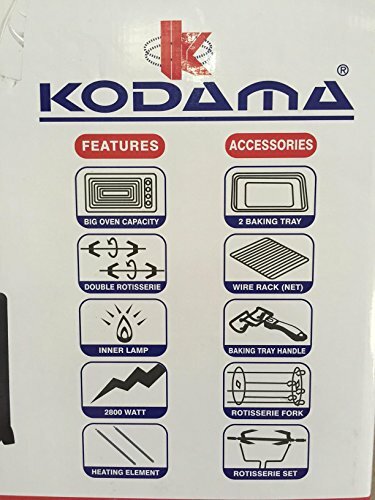 KODAMA 91 Litre Large Capacity 2800W Counter Top Electric Oven & Grill with Double Rotisserie, Baking Tray, Wire Rack - Rotisserie Set Included! The ultimate multifunctional mini oven! Grills, bakes, broils, boils, roasts, toasts and spit roasts to perfection 6 cooking functions including rotisserie spit roast, 60 minute timer and temperature adjustable between 100 - 250°C Extra-large 91L capacity in a compact design - great for homes, caravans, offices, student accommodation, camping & more! Includes rotisserie set, wire grill rack, baking tray & tray handle. Dimensions: 69cm x 47cm x 41cm (WxHxD) Enjoy the ultimate in cooking convenience with the Kodama 91L Mini Oven. A fantastic all-rounder, this unbelievably versatile oven grills, bakes, broils, boils, roasts, toasts and spit roasts to perfection - all in one sleek, compact design. 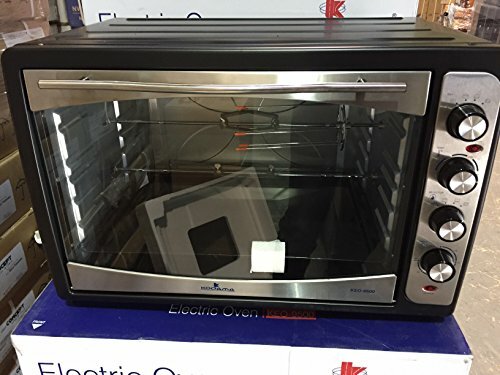 If you have more mouths to feed than cooking capacity or if kitchen space is at a premium, this Oven could be the answer to your prayers. Equipped with six heating functions; depending on your preference, you can use the upper grill, lower grill or a combination of both. 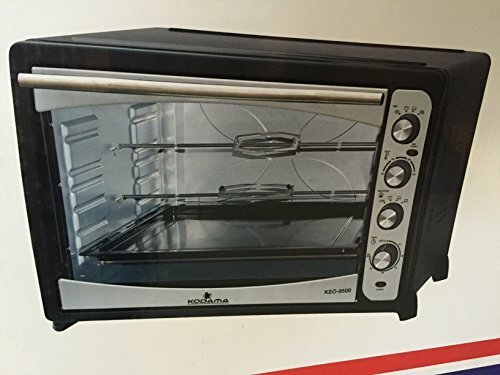 Functions: Upper grill Lower grill Upper and lower grill together Rotisserie Rotisserie spit roast function makes it easy to roast chicken, turkey, pork and other meats, and heat up kebab skewers. Family-sized 91L capacity provides plenty of room to rustle up an impressive meal for a hungry crowd, or simply cook for yourself. 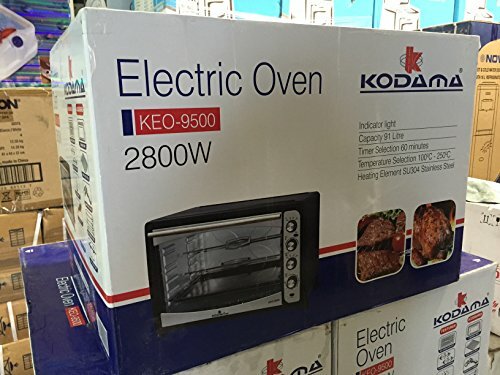 Powerful 2800W Heating Elements Easy to use dials allow you to adjust the temperature between 100-250°C and set the timer to cook for up to 60 minutes. The timer comes with a bell, so you'll know when food is cooked. Strong stainless steel housing with sturdy rubber feet.